The Transformers 3rd party scene is alive and well. 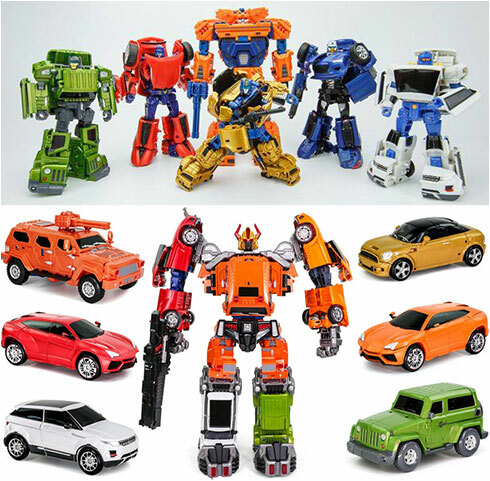 It seems like every day there is some new toy company crawling out of the woodworks with some new plastic version of your favorite Transformers character. Case in point, when I set off to write a post on my own firsthand experience with a number of 3rd party companies and their products, it ballooned into a 3 part piece. And now, here I am just a few months later with a whole lot more to write about, so here we go with part 4. For this specific post, I wanted to write about companies that have been around for quite some time now but for one reason or another, I never bought anything from….until now. Their first releases were a G1 style Megatron called Hegemon and oddly enough, an obscure Autobot Rollbar which they called Grind Rod. 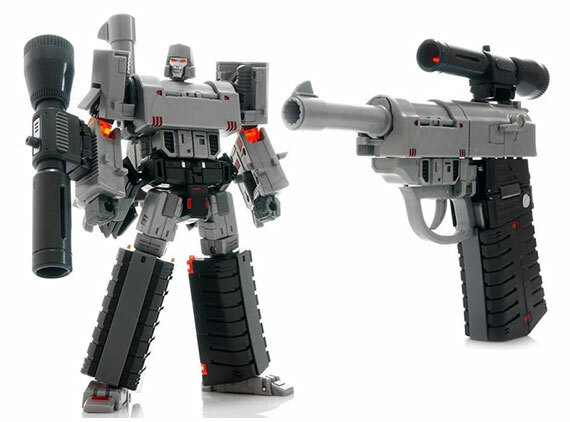 Now Hegemon was quite popular with collectors since it filled a need for a traditional Megatron to go in their Generations line that actually transformed into a realistic gun, something Hasbro could never do due to western toy manufacturing restrictions. In contrast, Grind Rod was the first member of a less popular Autobot subgroup of mini warriors called the Throttlebots. Toyworld set out to complete the group and add a twist, make them combine into a larger bot, which the original team never really did. Anyway, I skipped out on Hegemon cuz I was quite happy with my Classics Nerf Gun Megatron. 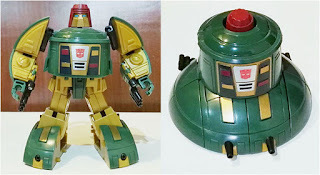 And I passed on Grind Rod and the rest of his team mates which were released in the following years...although I was sorely tempted by them since I was actually a fan of the Throttlebots. 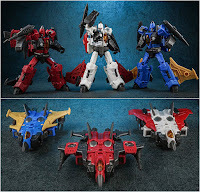 Eventually, I settled for cheaper KO oversized versions of these guys made by another company Wei Jiang. Although the designs were pretty dated and not quite “masterpiece” level in quality and look, I liked them quite a lot. So while technically they were Toyworld designs, I couldn’t count them as actual Toyworld purchases. But it did give me a taste of what they had to offer. Lately though, Toyworld has gotten pretty aggressive releasing quite a number of “masterpiece” style characters this year alone. Despite getting fairly OK reviews I passed on most of them simply because for the most part I wasn’t a fan of their overall look and I opted to get better looking versions from other companies. I finally did get their versions of masterpiece Cosmos and Seaspray, called Spaceracer & Wavebreak respectively. I got Spaceracer because at the time there wasn’t any other alternative around and he was quite decent and I would recommend him to anyone looking for a serviceable version of the character for their shelf. I have since replaced him though with X-Transbots’ version called Klaatu which personally I feel is better. But really you can’t go wrong with either. Now Wavebreak is a another story. I was presented with various options from a number of 3rd party companies for a masterpiece Seaspray (can you imagine? Seaspray!) 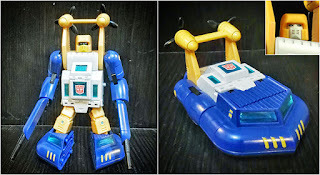 and I ultimately went with Toyworld simply because to me he looked closest to the cartoon design or what I envisioned my Seaspray to be...which was tubby. And honestly, this guy would’ve been perfect except Toyworld frustratingly dropped the ball on some details and design elements...adding odd blue translucent panels to the torso (I can live with that), not giving the guy bicep swivels (quite irritating) and finally PAINTING THE DAMN FACE WHITE! This one really bugged me to high heavens but I figured I could paint it myself...which was a pain but I managed to do a passable job (by my standards)...so he remains on my shelf. 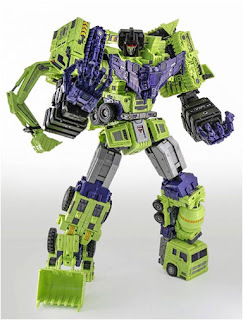 One thing worth noting about Toyworld is that they have made what many collectors considered the ultimate Masterpiece combiner, Constructor, their version of Devastator. While I don’t have this, he is definitely on my wishlist of future purchases. 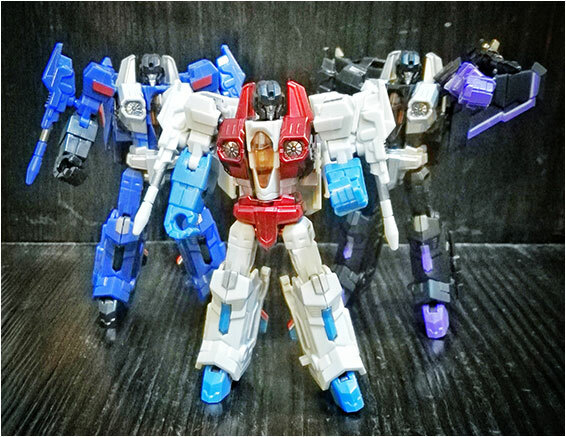 Iron Factory is one of those niche companies that focus on making smaller “legends” sized Transformers. Now in the official retail Transformers toy terminology, the legends size class refers to the smallest size (approx around 2.5” - 3” in height) of Transformers that are sold at the lowest price point, and are usually the most basic Transformers toys out there in terms of articulation and engineering. 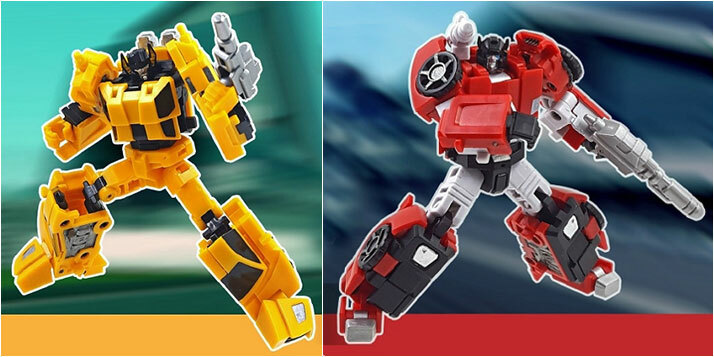 Now Iron Factory’s products are often referred to as legends sized by collectors but have pretty much nothing else in common with the typical Hasbro produced legends. Instead, Iron Factory makes legends scaled Transformers that are highly detailed and articulated. Sure their smaller size means that some compromises have to be made, but for the most part I would say they could beat out many of the bigger and more advanced Transformers released by Hasbro in terms of quality, build and design. But as interesting as their products looked...I just wasn’t into the scale, which didn’t fit into anything else I was collecting. That is until they put out something I could not resist. As I’ve written in past posts, I am what you would be called a “seeker whore-der”. 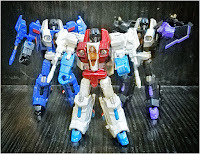 Basically I love getting different versions of my favorite Transformers trio, Starscream, Thundercracker & Skywarp, the original three jet Decepticon jets better known as seekers. So when Iron Factory released their version of the seeker trio this year, they got me...even though I already had an official legends version of the trio by Hasbro. Comparing them side by side, the difference was like night and day. Although I do plan on getting that next 3 pack...and they have me at another 2 pack of my favorite Lambo brothers Sunstreaker & Sideswipe, I do realize that this is another potential rabbit hole that I don’t intend on falling into….only time will tell if I will continue to be able to resist...although they do look like the PERFECT size to hang around with my Trypticon…. Like Toy World & Iron Factory, Unique Toys is one of those companies that have been around for awhile now that I just never felt compelled to get anything from. Unlike the other two though, it wasn’t because they specialized in a type & style of Transformers toy that didn’t fit with my collection, it was because of really negative reviews of what they put out. 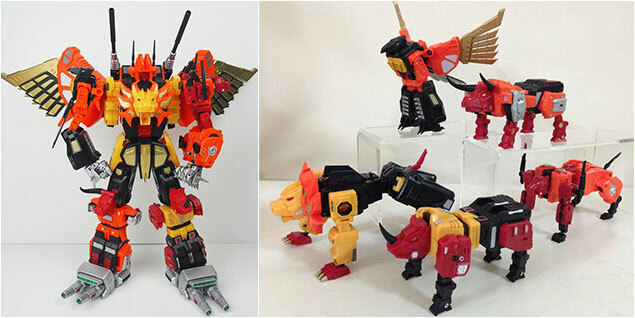 Their first major release was their take on a G1 favorite, Predaking which quite frankly didn’t look all that great, and as reviews showed wasn’t an overall good product. This was an easy pass. But they continued to chug along and little by little their reviews got better and better...but for one reason or another I was never really convinced. Their more notable releases were an MP version of the Terrorcons/Abominus, as well as a bunch of 86 movie characters such as Allen(Springer), Buzzing(Blurr) and Maniaking(Galvatron). But whether it was the way they looked (wrong proportions, too big & chunky, wrong colors you name it), or some impossibly complicated transformation, there was always something that I found off with each release that bothered me enough to pass on them all. 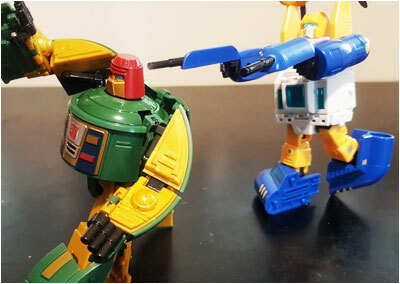 Then a few months ago pictures of some new Combaticon Brawl & Swindle toys started popping up online...and they looked...great! They were the perfect mix of the cartoon and toy aesthetic without leaning too much in either direction. Pretty soon, word got out that these were upcoming releases of Unique Toys. 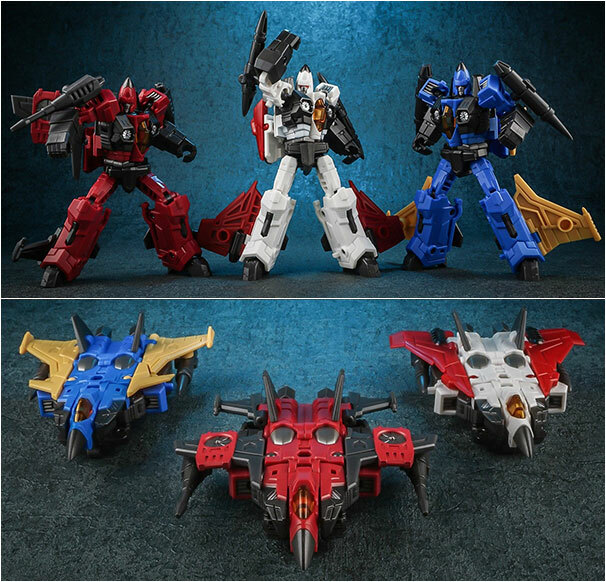 At first I didn’t make the connection that these guys were by the same company that gave us those below than average Predacons a few years earlier. Which was probably a good thing, by the time I figured out the connection I was so dead set on getting these guys that it didn’t matter any more. 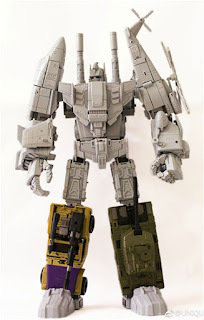 A few months later, their first MP style Combaticons Archimonde(Brawl) and Gahz'ranka(Swindle) were released. And they were pretty pretty good….no they were pretty much perfect. On my opinion probably two of the best Transformers 3rd party toys released...ever. Aside from looking just right, their transformations were interesting, not overly complicated and well..unique and their overall build was solid...it was really hard to find fault in either one of them. 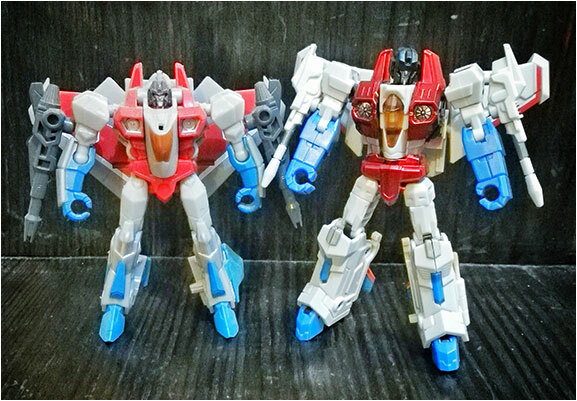 Their version of Onslaught dubbed Kalecgo will be out next month and hopefully the final two members (of which they’ve already shown prototypes) will follow shortly thereafter. I’m looking forward to completing the team and forming their version of Bruticus called Ragnaros(seriously who comes up with these names???). 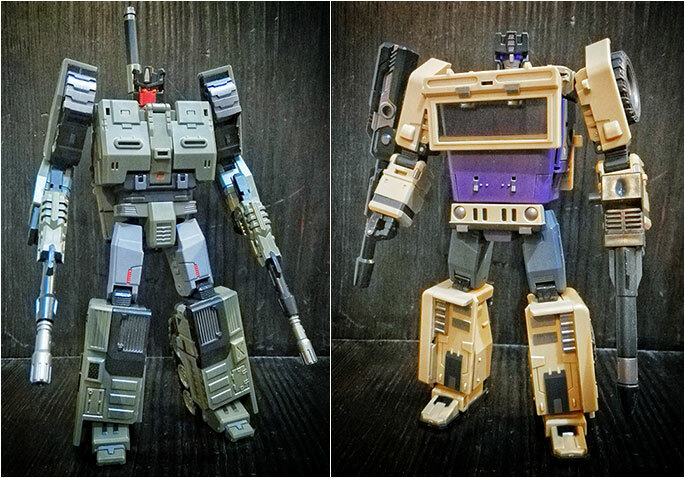 3rd party Gestalts are usually more hit than miss, but if the first two Combaticons are any indication on how the rest of the team will end up, then I’m pretty optimistic that their combined form will be great! Having these bots in hand and looking back at all their older releases it’s quite amazing how much has changed for the better for Unique Toys. They definitely get my vote for most improved 3rd party company. In the next part, I’ll go over a few new players in the 3rd party market….it never ends!